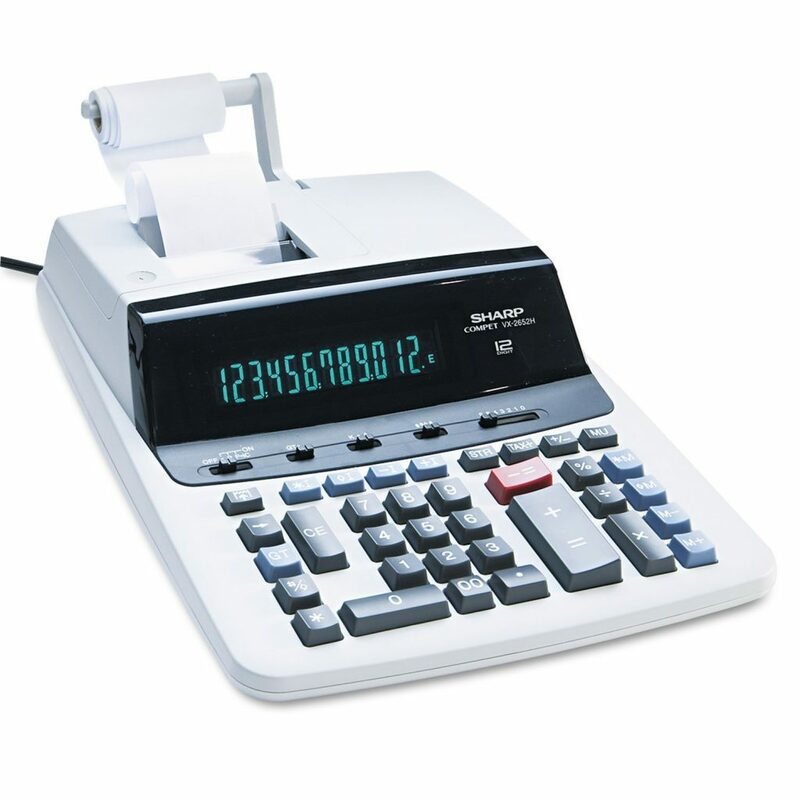 The Sharp VX-2652H Commercial Calculator has a large, 12-digit display, prints in two colors at 4.8 lines per second, and comes with two independent four-key memories. Shortcut buttons and setting switches save time and ensure accuracy. The calendar/clo ck function prints the date and time on every tape, for more accurate documentation. The calculator plugs into any standard outlet, eliminating the need for expensive batteries while ensuring you never lose your work because of dead batteries. The Sharp VX-2652H has a commercial-grade, heavy-duty printer that produces 4.8 lines per second, enabling you to make clear, fast documentation for bank deposits, expense reports, or cash-drawer counts. Positive numbers print in black, and negative numbers print in red, eliminating mistakes due to misread numbers. A clock/calendar function prints the date and time on each receipt, eliminating confusion when working with multiple tapes. The Sharp VX-2652H Commercial Calculator has a 12-digit display that shows numbers in a large 17-millimeter size, eliminating the need to squint. The blue florescent digits are easy to read, and the tilted, fixed-angle of the display provides a comfortable reading experience when seated at a desk. The Sharp VX-2652H comes with a mark-up key to simplify cost/sell/margin calculations, percent changes, and automatic discounts to make calculations simple and fast. The floating/fixed decimal and rounding switches ensure that your settings stay the same for each transaction, providing accurate, consistent numbers.